Support in implementation of the EU Strategy for the Danube region. Download here more information on Cross-border Cooperation: achievements and perspectives of the Republic of Moldova. Download here more information on Cross-border Cooperation Programmes for the period 2014-2020. With an area of about 800 thousand km (a fifth of the area of the EU) and a population of over 100 million people, the Danube region is vital for Europe. The Danube Basin has a number of advantages that may allow its quick development: the geographical position (openness to the east) cultural, ethnic and natural diversity, important sources of renewable energy (hydro, biomass, wind and thermal energy), advantages related to the environment (flora and fauna, water resources, Danube Delta). The Danube Region has a potential of economic growth which has not been harnessed sufficiently. As part of the Pan-European Transport Corridor VII of the EU, the Danube is an important navigable way, connecting, through the Rhine-Maine-Danube network system the Constanta harbor with the important navigable way, connecting, through the Rhine-Maine-Danube network system the Constanta harbor with the industrial hubs in the Western Europe and the Rotterdam harbor. The extended basin of the Danube covers states and regions that may benefit from direct access to the Black Sea in the future, and the importance of linking the EU to the extended region of Caucasus and the Central Asia has already been recognized through the Black Sea Synergy. In this context, also considering the initiative launched by Romania and Austria in 2008, the Council of Europe (June 18-19, 2009) requested the European Commission to take the necessary steps for adopting a European Union Strategy for the Danube region by the end of 2010, following the model of the Strategy for the Baltic Sea. In January 2010, the European Parliament presented the "European Strategy for the Danube Region" for oral debates, followed by adoption of a resolution in which the members of the European Parliament asked the European Commission to launch this strategy, following a process of consultations, by the end of 2010. The members of the European Parliament stressed that the EU Strategy for the Danube Region should be developed in the following areas of inter-regional cooperation: social protection and development, sustainable economic development, energy and transport infrastructure, environment protection; culture and education. Later, the European Commission launched the public consultation (February-June 2010) during which conferences, seminars and round tables were held, in all riveran states. As result of these consultations, a Communicate was developed by the European Commission and presented on December 8, 2010, on the EU Strategy for the Danube Region, and an Action Plan. The Government of the Republic of Moldova approved the Decision no. 694 of 04.08.2010 on approval of the Inputs (proposals) of the Republic of Moldova to the European Union Strategy for the Danube Region, defining the priority strategy areas. In November 2011, the Deputy Minister Veaceslav Gututui was appointed as the national coordinator of the EU Strategy for the Danube Region. On December 1, 2011, the National EUSDR Coordinator convened a meeting of national experts on priorities of the EU Strategy for the Danube Region to discuss the progress of our country under the EUSDR and about the potential project concepts that will be presented and developed with other states in the region (Ist joint meeting). On December 12, 2011 a plenary session was held during the working visit of the Romanian delegation headed by the National Coordinator of Romania on the EU Strategy for the Danube Region, Viorel Ardeleanu. The Romanian counterparts presented the experience in identifying, initiating and developing projects under the EUSDR (II joint session). During the period between January 30 and February 1, 2012, the Moldovan delegation led by Mr. Veaceslav Guţuţui, Deputy Minister of Regional Development and Construction, made a working visit to Romania (Bucharest), during the second meeting of the national focal points and Coordinators on the priority areas of the EU Strategy for the Danube Region. The Partnership Agreement between the Ministry of Regional Development and Construction and the Council of Danube Towns and Regions was signed and based on this Agreement, the members of the Council present at the meetings of Coordinating Groups will represent the Republic of Moldova as observers, without voting right but with the responsibility to bring to the knowledge all information of interest for Moldova in due time. On May 4, 2012 a meeting of national experts on EUSDR priority areas took place, during which information on the strategy, the responsibilities of experts and of the national coordinator on priority areas were presented and Moldova's participation in EUSDR activities and events was discussed (the third joint meeting). Also, the process of developing the national Plan of Actions for EUSDR implementation in the Republic of Moldova was launched and the concept of the operational structure of the EUSDR in the Republic of Moldova was presented. On May 29, 2012 the meeting of the national experts on EUSDR with the Secretary of the Council of Danube Towns and Regions from Romania was held. The participants at the meeting discussed the importance of strategic partnership, the communication under EUSDR and the experience of Romania and the Council of Danube Towns and Regions in Strategy implementation. On June 4, 2012 the information session on opportunities provided by the EUSDR was held with participation of the representatives of South, Center and North Development Regions. The participants discussed the activities to be undertaken by the Regional Development Agencies on the Danube Day. On June 7, 2012 the meeting of the experts on EUSDR priority areas took place. The participants discussed the development of the action plan on implementation of the EUSDR in Moldova, about the organization of events on the Danube Day, the improvement of communication and the visibility of actions under the EUSDR, as well as creation of working groups at the level of institutions involved in the transposition of the provisions of EUSDR. Also, on June 7 the meeting with H.E. Mr. Anita Orban, High Level Ambassador for Energy Security of the Ministry of Foreign Affairs of Hungary, coordinator, was held at the level of EUSDR macro-region to encourage more sustainable energy. The purpose of the meeting was to discuss the energy security of Moldova and to identify the priority actions in the energy area of the EUSDR. On June 29 events related to the Danube Day were organized. - between June 21 - 26, 2012, the South Development Region held an information campaign on the European Union Strategy for the Danube Region in Ştefan-Vodă, Cahul and Cimişlia, attended by representatives of the local public administration in the South region. - Center Development Region held on June 22, 2012 a round table entitled "European Regional Cooperation Strategies and Programs - new perspectives for regional development". The event was held in Costesti village, Ialoveni rayon, with participation of representatives of the Ministry of Regional Development and Construction and stakeholders in the Center region. - On June 29 the North Regional Development Region held a roundtable in Balti dedicated to the Danube Day, attended by stakeholders in the North region of the Republic of Moldova. On July 2 the meeting of the institutional work subgroup was held at the National Tourism Agency. During the meeting, the participants discussed about the visit of the representatives to the World Travel Day, the cooperation with the civil society and the business environment and EUSDR implementation on the priority area "Promoting culture and tourism, as well as direct contacts between people". The Joint Operational Program defines the context, the objectives, the structure, the allocation of funds by priorities, implementation bodies and procedures of the Program. It was developed by the three program countries and sent to the European Commission on March 10, 2008 for negotiations and approval. The Joint Operational Program Romania-Ukraine-Moldova 2007-2013 was approved by the European Commission on July 29, 2008. The program aims to stimulate the development potential of the border region within safer border areas, by fostering contacts between partners on both sides of the border, in order to improve the economic, social and environmental conditions. Provision of competitive grants under Calls for Project Proposals (Biddings). Economic/social infrastructure, environment protection works, workshops, trainings, conferences, tourism promotion etc. The general and specific project selection criteria are approved by the Joint Monitoring Committee, at the proposal of the Joint Managing Authority (MDLPL, Romania). *At least one partner should be from Romania and one partner from Ukraine and/or the Republic of Moldova. Projects between Ukraine and the Republic of Moldova only are not accepted. The lead partner and the other partners must reside in a project eligible area. g. Moldova, Georgia, Armenia, Azerbaijan: the whole territory. The total budget of the program is EUR 18,862,000 (EUR 17,035,000 ENPI and EUR 1,557,000 national co-financing). The estimated allocation of IPA funds for Turkey's participation in the program is EUR 1,000,000 per year for the period 2007 - 2009 (the allocation will be confirmed by an annual financial decision). The funds are provided through the European Neighborhood and Partnership Instrument (ENPI), an instrument that supports the implementation of the European Neighborhood Policy in the partner countries. The program countries must provide 10 per cent of the funding, at project level (sources may include: state budget and beneficiary budget). The overall program objective is to support the economic and social development of the country in the Black Sea basin regions, based on sound regional partnership and close cooperation. The program priorities are focused on the jointly identified needs by the partner states, thus having a cross-border impact. This program will finance actions related to promotion of economic activities, environment protection, workshops, training courses, conferences, seminars, networking for tourism promotion etc. The Program targets local and regional authorities, development agencies, environment and tourism agencies, trade chambers, NGOs, education and cultural institutions etc. All projects are based on cross-border partnerships, with partners in the EU member and partner states. The applicant must reside in one of the areas eligible for the program. Each partner implements some of the joint program activities on the territory of its state. The projects must have a minimum value of EUR 50,000.
two states with which the EU has special relationship: Moldova and Ukraine (Oblasts: Cjermovestka, Ivano-Frankiviska, Zakarpatska, Odessa). Projects submitted by the partners in Moldova and the eligible regions of Ukraine will be financed under the Interregional EPNI Program (Joint budget - 2 mln. Euro ), to be shortly approved by the European Commission. In order not to exclude the participation of partners from Moldova and Ukraine in the current bidding, the activities of these partners will be covered by the FERD funds, the value of which amounts to 10 per cent of the European Commission contribution to the program. To create transnational partnerships in areas of strategic importance in order to improve the process of territorial, economic and social integration and to support cohesion, stability and competitiveness. 3. improving the framework conditions and opening the path to innovation. 3. improving the framework conditions for multimode platforms. 3. promoting the use of cultural heritage for development. Provision of competitive grants under Calls for Project Proposals (Tenders). The general and specific selection criteria for studies/actions vary, depending on priorities, and are established/approved by the Monitoring Committee. number of partners: at least 3 partner states, of which at least one is not a member state. Estimated Project Duration: 24 months. Estimated Value of a Project: 1.8 million Euro. 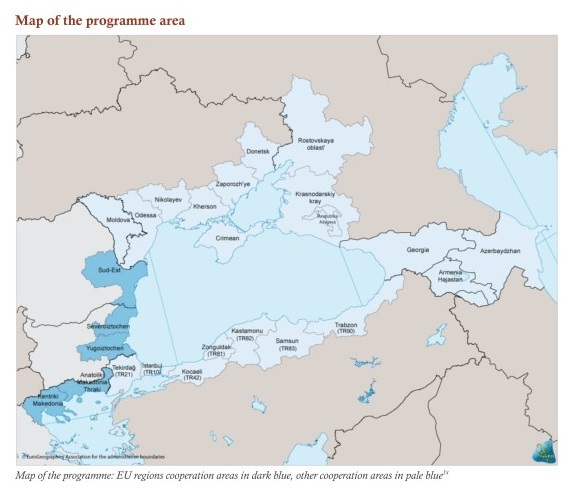 The Black Sea Basin Programme 2014-2020 is part of European Union's Cross-Border Cooperation (CBC) under its European Neighbourhood Instrument (ENI). Black Sea Basin ENI Cross-Border Cooperation programme 2014-2020 - Objectives and Priorities. Promotion of gender equality, and opportunities for youth. To achieve its objectives, the programme will award grants to CBC projects selected through calls for proposals. Two calls for proposals are expected to be launched during the programme lifetime, in 2016 and 2018. The recommended financial size of projects will be further defined in the calls for proposals. For the period 2014-2020, the European Union will finance the Joint Operational Programme Romania- Republic of Moldova, through the European Neighbourhood Instrument (ENI). 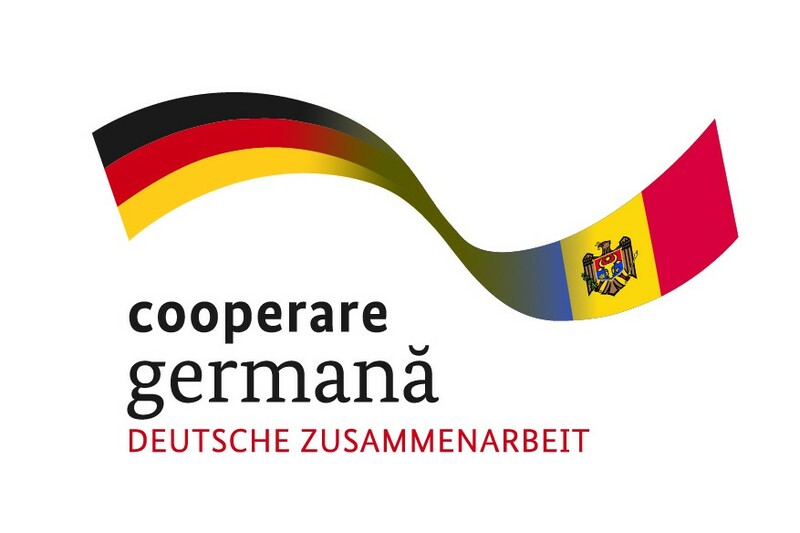 The program addresses the border area between Romania and Republic of Moldova, and will contribute to the overall objective of the European Neighbourhood Instrument: evolution towards a region of prosperity and good neighborliness, achieved through Cross Border Cooperation actions to the benefit of neighboring EU Member and Non-member States. 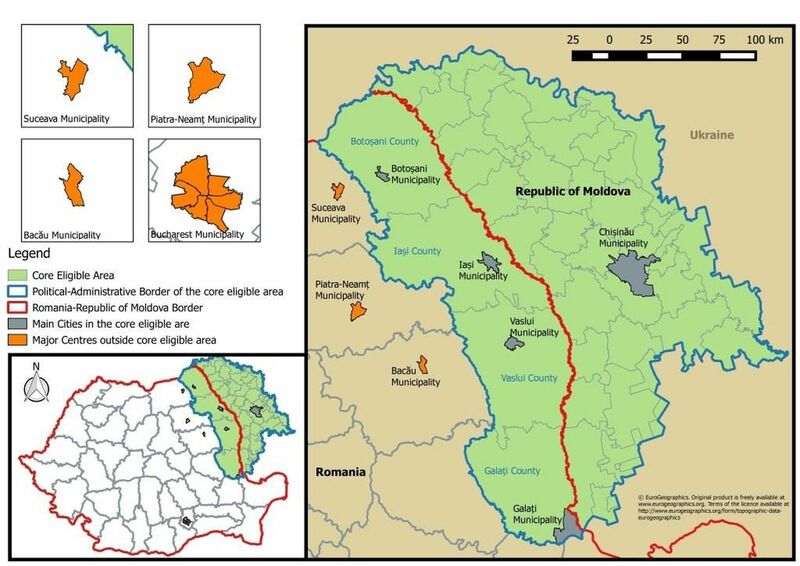 Republic of Moldova: the whole territory. EU financial allocation to this program is EUR 81 million. The minimum co-financing to be ensured by the two countries is 10% of the EU contribution. The process of preparing the Joint Operational Programme Romania-Republic of Moldova is in progress at present. There were established joint bodies which are designed to identify the common development priorities of the two countries in the border area as well as the list of large infrastructure projects which is to be attached to the program. In December 2012 the European Commission proposed to create a new transnational cooperation programme for the 2014-2020 period. Danube Transnational Cooperation Programme is financed by the European Neighbourhood and Partnership Instrument. The Programme will support development projects with transnational impacts, the thematic objectives of which are the following areas: research, technology development, innovation, environmental protection, resource efficiency, sustainable transport and infrastructure promotion, institutional capacity building and efficient public administration. The Danube programme area includes: Austria; Bosnia and Herzegovina; Bulgaria; Croatia; Czech Republic; Germany (Baden-Württemberg and Bavaria) not whole territory); Hungary; the Republic of Moldova; Montenegro; Romania; Serbia; Slovakia; Slovenia; Ukraine (not whole territory). The Eastern Partnership Territorial Cooperation Programmes will largely build on the experience of the ENPI cross border cooperation (CBC) programmes implemented along the EU external borders in what concerns focusing on local development needs as well as thematic coverage. The overall objective of the territorial cooperation programme Moldova - Ukraine is to strengthen cross border contacts between local authorities, communities and civil society organisations to help develop joint solutions to common social and economic development challenges. The call for proposals are expected to be launched by the end of April 2015.